We now know just how young the young Han Solo will be—and the key moments in his early life the film will explore. 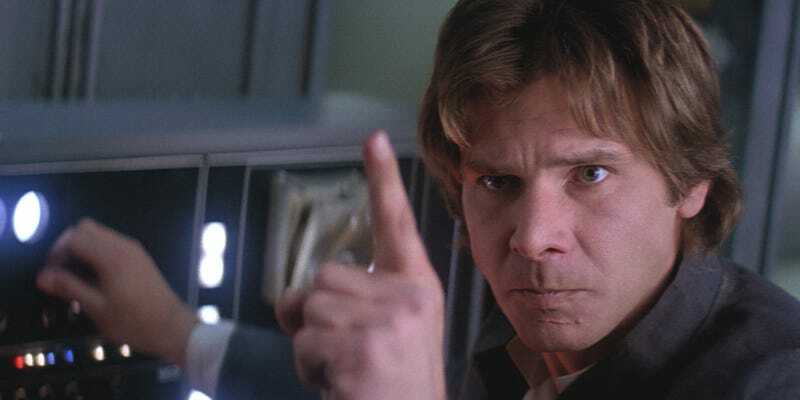 At a discussion in Los Angeles Thursday, Disney CEO Bob Iger revealed that the Han Solo Star Wars Story will take place as Han ages from 18 to 24. It will show him acquiring his iconic ship the Millennium Falcon, meeting his partner Chewbacca, and “getting his name,” according to Wall Street Journal reporter Ben Fritz. Now, none of this is exactly earth-shattering. You don’t put Lando in a movie about Han Solo and not show how he won the Millennium Falcon. And it was previously revealed that the film will explain how Han saved Chewbacca’s life, setting up the life debt and friendship between the two. So what does “getting his name” mean? Is Han Solo not his given name? Is it a cool smuggler alias? No, I think what Fritz means is “making a name for himself,” but just doing so in under 140 characters. Things like beating Lando for the Falcon, saving Chewbacca, and whatever else will help give Han the reputation and swagger he has later in the series, where he’s an infamous smuggler who has wronged Jabba the Hutt and others. Or, maybe, it is literally “getting his name.” We don’t know, but that would be weird. I’m sure I’ll say this a million times leading up to 2018 but I have mixed feelings about this. Lots of what makes Han Solo so great is his mysterious past and all these events just being hinted at. Now we’re going to actually see them, and as exciting as that is as a fan, you also don’t want the character to be demystified. All we’ve imagined about the young Han will be difficult to top in reality. Then again, with Lawrence and Jake Kasdan writing, as well as Phil Lord and Chris Miller directing, there’s a good chance seeing these things play out will equal our expectations. Or at least we hope. Starring the 27-year-old Alden Ehrenreich, the untitled Han Solo film opens May 25, 2018.